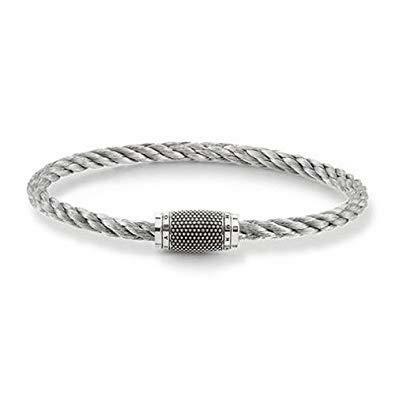 From Thomas Sabo's 'Rebel at Heart' collection is this classic Silver Threaded Bracelet. A perfect gift for him. This Thomas Sabo Silver Threaded Bracelet 21cm features a plaited silver strap which gives the bracelet an individual and authentic look. The clasp has many small dots inside of it, which gives the bracelet a masculine edge. The branding 'Thomas Sabo' is featured in small text around the clasp. This bracelet is crafted from 925 Sterling Silver.